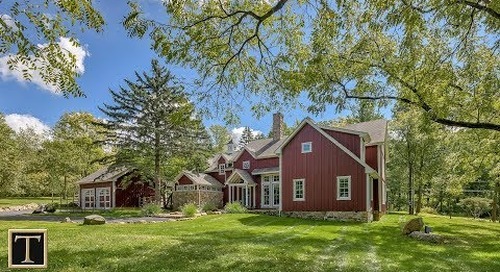 Located in picture perfect Lebanon Township, this home is the ideal blend of peaceful rural living and easy access to metropolitan areas including New York City. Backhus Estate is an upscale, cul-de-sac neighborhood comprised of individually styled homes. This property, designed by the current owner, is created in a sophisticated, relaxed style offering rich architectural details and material selections. From the moment you enter the glass-paneled front door, the sweeping staircase and elegant foyer immediately sets this home apart from others. Plantation shutters throughout as well as custom coffered ceilings, crown moldings and recessed lighting all contribute to the upscale ambiance. The serene renovated kitchen includes a beautiful center island with a Franke sink, pretty glass-fronted cabinets and, at the dining room entrance, there is a bar with a Viking wine refrigerator. In addition to the family room with cathedral ceiling and fireplace there are also three additional softly-lit rooms for quiet reflection, plus a home office or a guest room with a private deck. A second set of stairs in the kitchen leads to the bedroom level. The second story master suite has a fireplace, two walk-in closets and a spa-like bath with freestanding tub, frameless glass shower and a double vanity with concrete countertops. In addition to the princess suite with private bath, there are two more bedrooms which share an updated hall bathroom. Outside, professionally landscaped grounds offer two decks, a stone patio and a water feature pond, the perfect backdrop for outdoor entertaining. An impeccable two-car garage and ample additional parking all enhance the ease of living in this splendid property. This home's convenient location is less than two miles from the shops in Califon and within four miles of all schools including Voorhees High School, a nationally-recognized Blue Ribbon school. Also nearby is pristine Ken Lockwood Gorge and Teetertown Preserve for fishing and hiking as well as 15 miles of trails along the Columbia Trail for biking, horseback riding and cross country skiing. lush architectural details include Plantation shutters & coffered ceiling. The glass front door, elegant foyer & sweeping staircase immediately sets this home apart. The renovated kitchen offers a center island, glass cabinets & Viking wine refrigerator. In addition to the family room there are 3 other rooms for quiet reflection, a home office or guest room w/ private deck. A 2nd set of stairs off the kitchen leads to 4 bedrooms. The master has a fireplace, walk-in closets & bathroom w/ freestanding tub, frameless glass shower & double vanity w/ concrete counter tops. 2 decks & patio for outdoor entertaining.